It was almost like a scene out of a really bad movie at first. My plans were becoming a disaster. I found that nearly every hostel in Wales was booked up on the weekend I wanted to visit, so I chose Llandudno not because it was high on my list but because it was the only place that had any space for me. And it turned out that it had quite a bit. When I arrived at my hostel I found that I was one of only 5 or 6 people in the entire place. The rest of town was empty as well aside from a rather large group of elderly women who were apparently in town to see the opera. As I walked the waterfront on the evening I had it to myself. The pier, which at this time of year appeared as a deserted carnival scene, I also walked alone. I laughed a little bit at the painful humour of my situation: staying at a deserted summer resort town in the North of Wales on St. Patrick’s Day weekend; a travel fail of epic proportions. I could almost hear the cries of happy drunks across the water in Ireland, a place I planned on spending St. Patrick’s Day except that my propensity for confusing important dates of the year once again spoiled my plans. I spotted a canoe tied gingerly to a rock and wonder how long it would take me to paddle to Dublin. Still, as time wore on in Llandudno, I found myself enthralled by its quirks and entertained by its idiosyncrasies. 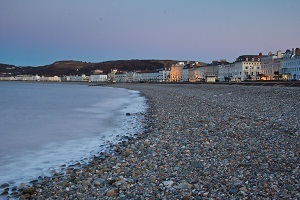 In many ways, Llandudno was a little bit like that strange aunt everyone has scares you at first but as you grow older you realize all the great stories you have about her to tell people. I began to walk Llandudno with new eyes. I entertained myself dreaming up story lines to a movie that could play out in this coastal creature town. It wasn’t hard to do, each building, each piece of architecture and each landmark seems to be pulled from a movie itself. It doesn’t take long for me to realize that my time in Llandudno could easily be a film, all that it’s missing is a good ending. Ahh, the story of my life. Yes Sabina – It’s full of old people haha. But there really isn’t anything wrong with that. Old people know how to party. Glad you grew to love it, but gutted for you that you missed out on the St Paddy’s Day fun. I had friends in Sydney and others in Colombia who celebrated just as hard as the Irish. It really does seem to be a worldwide party no matter where you’re from! Arianwen – I’m sure that in my part of Canada we party on St. Paddy’s day harder than the Irish haha.